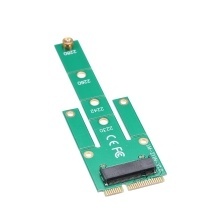 Use this adapter card to convert the ordinary MSATA interface SSD to M.2 NGFF interface SSD. There are 4 fixing holes on the board, which are 22*30 mm, 22*42 mm, 22*60 mm, 22*80mm. According to the length of the card slot in your machine, you can break the card to position. It is compatible with PCI Express M.2 specification 1.0. 3 screw holes 2242/2260/2280 available to fix PCB board. It ONLY support B+M key M.2 SATA SSD. Note: Please be sure it is suitable for your slot before breaking it off.